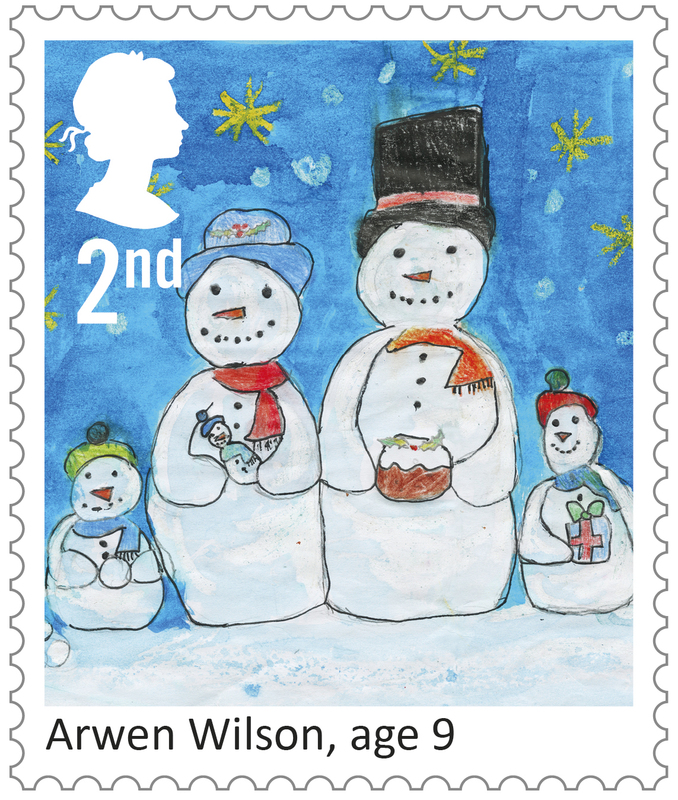 Regular readers will recall that this year's Christmas issue will include not only the regular 8 values with a religious theme, but also stamps designed by the winners of this year's design competition for children. All these stamps will be issued on 7 November, the competition winners being in both standard and Large Letter stamps. But one reader has sent this picture today, showing the 1st class stamp issued already and posted in West Yorkshire. Now we know that Christmas stamps used to be issued earlier, and that the surface last posting dates for international mail are approaching very soon, but this is exceptional. And it's very easy for many special stamp issues to be sold early, despite the selling date in the margin (not usually present on Christmas stamps), but surely anybody with a hap'orth of sense would know that mid-September is far too early to sell Christmas stamps?! 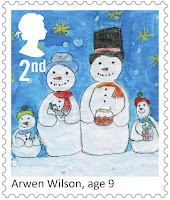 And (2) Post Office Ltd, in an article about the Swindon Distribution Centre says that "The first delivery of Christmas stamps was made on 25 September and the last will arrive in branches on 24 October". Which begs an even bigger question if the stamps had not even been sent to branches when this article was first written! I was pondering card shops. It is a pity they don't sell nice stamps, especially international values (unless they happen to house a post office, like the one I go to). How feasible would it be for card shops to stock sheets of stamps - 1st, 2nd, and the international values? Some chains sell booklets and regularly ask if you need any stamps. At a branch of Scribbler earlier in the year, I was asked and gave my standard joking reply of "only if you've got interesting ones" - the assistant promptly produced a David Bowie 6x 1st booklet. So I bought it (even though I didn't need stamps) to encourage the idea. I've seen NT shops sell booklets of international postcard stamps - presumably they know what their customers are likely to be. In Norway a few years ago, nearly all the tourist shops selling postcards had stocks of stamps for local and Europe and international rates. Given that greetings cards sometimes end up as Large Letter - then keeping sheets of 1st and 1st Large might be a better idea. Wow, that's great about the David Bowie retail booklet. I have not seen the interesting booklets in shops before but was aware of them. I do hope the international postcard stamps are not the the ones from Universal Mail - postcards sent with those on take the long way around (via far flung countries taking months to go 400 miles or so to Europe). I did suggest to RM to have a single stamp to make up 1st/2nd to their respective Large rates. I'm not sure if there are booklets for the large rate but would be a good idea as some birthday cards have badges and make the envelope thick. I just received my Order Advice Note from Royal Mail TH, with the cost of the Christmas issue.I am astounded at the £51.16 I am being charged, is this issue gold plated ? Compare it with what you received last year and it will probably only be different by the increased face values, and the addition of the four competition stamps. If you have the set of 12 (£12.31), the Generic Sheet, and the two 2nd and two 1st class booklets (£29.04) it will soon mount up. Add a presentation pack (£12.81) and first day cover.... (All prices are my calculations, and may be incorrect either way). I normally only get the Stamps, Mini sheet if issued, & the two retail books,( £14.52) This year the competition stamps will be extra, but without them the cost last year was just over £35. So I wait in anticipation. I forgot the mini-sheet! So £12.31 for the set, £9.36 for the MS, £29.04 for the booklets makes £50.71 plus 45p handling charge £51.16, kerching! The competition stamps will be in basic and large letter sizes, and there will be booklets for the conventional and competition stamps. Thank you very much Ian I did not realise that the competition stamps would also come in a booklet, your calculations are correct well done!